My goodness it really doesn’t get any better than this. You’re gonna make this, you’re gonna freak at how unbelievable it is. This will be the best shrimp you’ve ever made. Making grilled shrimp is excellent for a meal or as an appetizer. It’s also great as an hors d’oeuvres at any party or event. 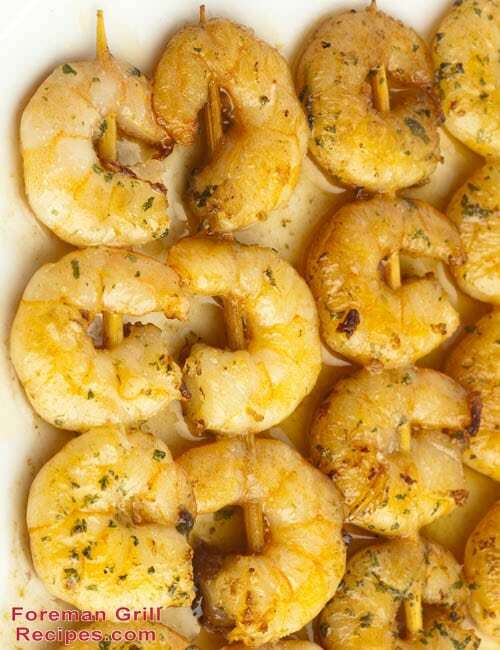 The fact that you can make this delicious shrimp on your Foreman Grill is equally unbelievable. It’s almost a foolproof recipe too. You’ll want to start with some good shrimp. The fresher the better but frozen shrimp will work equally as well. Garlic powder will work in a pinch, but fresh garlic is always the way to go. Add fresh parsley, and you’re on your way to culinary delight! Start by melting butter in a small sauce pan and add garlic to it just long enough enough so it gets a little brown – maybe a minute or so. Transfer to a shallow dish. Place deveined and shelled shrimp on skewers and coat well with the butter garlic mix. Sprinkle coated shrimp skewers with paprika, parsley, basil and pepper. A light brushing of olive oil on the grill might be a good idea. Though the Foreman Grill is non-stick, shrimp can become very sticky so the oil will make cooking and cleanup much easier. Then preheat your grill with the lid closed for at least 5 minutes. Use high setting if you have it. Just prior to placing shrimp skewers on grill, spritz them with some lemon juice. Not too much though. Place shrimp skewers on grill, close lid, and let cook for approximately 3-5 minutes. Give the skewers a turn after 2 minutes to assure even grilling. When shrimp are done it will be firm to the touch with an opaque color. Serve immediately. Feel free to adjust the amount of ingredients as necessary, The above amount is for 2-3 people. We have used the skewers but have found to just scatter them on the grill works well also. We use butter, Old Bay and Zaterans liquid in moderation. Man they are good.